Cross-country skiing is new for me. I’ve be prancing around on thin planks for a couple of years as a way of getting some exercise, usually when the weather is not good enough for proper skiing. I’m slow, and neither especially stylish nor experienced. But I enjoy a challenge, so when Nick suggested the Vasaloppet last September, I’d agreed within a matter of hours by booking a start number and a flight to Stockholm. Only then did I read the small print to realize quite what I had signed up for. The website reads (as it should) like that of any serious marathon, with training plans and tips, details of cut-off times, the course profile and a list of past winners. It also recommends at least 500kms of training. With a really poor winter in Geneva, I’d struggled to find enough snow to eek out 300kms of training– the bare minimum needed. Still, I’d had some long training runs and tested all my equipment and was as quietly confident as could be expected under the circumstances when I boarded the plane. 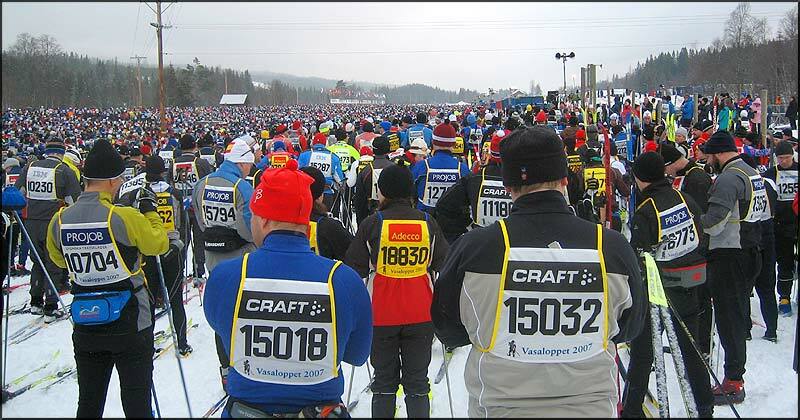 Here's what it looks like to be last in a queue of 15,000 skiers. To her credit, Louise filled the slot as our logistics manager supremely. She had arranged a hire car for the 5 hour drive to Mora through endless snowy Swedish forests. I sat in the back next to ten pairs of skis feeling like some kind of weird skiing pimp whilst she and Johanna jabbered away in the sing-song lilts of Swedish. We arrived in Mora in time for an early lunch of Swedish meatballs and to pick up our start numbers, stopping to glance at the finishing stretch in Mora. Louise, the veteran, commented on how happy we would feel to reach this point, but to me it all seemed so distant still. We drove another hour to the start point, following the route of the race in reverse. As a veteran of 3 Vasaloppets, Louise called out each village and its significance in the race, but it all meant nothing to me. We arrived at a Fred's place in Sälen (thanks! ), cooked our mountainous evening pasta meal and retired early to bed with bloated stomachs. The start gun caught me off-guard, still adjusting my music selection on the iPod. We immediately began moving forward, which surprised me further as I had expected a 10 minute delay before moving. The other 15,000 skiers and I were soon coasting along in our first warming steps. The initial glide stopped abruptly after 500m; the route went from 54 parallel ski tracks crossing the road onto two narrow cuts up the first hill. Everyone waited as the first skiers climbed about 5 abreast up the hill. I looked behind me and got the distinct impression I was right at the back of the pack, although once I got onto the hill I realized there were several hundred still behind me. This was a painful first hour – fighting to keep your place and stay upright without breaking anything, whilst hardly moving forward at all. When I checked my GPS later, I discovered that I had been standing still for 43 minutes in the first hour. I also moved only 2.5kms in that time, of which 500m was just getting to the start line and didn't even count. One of my observations on the climb was the poor standard of skiing. People were falling over themselves and seemed unable to stand upright. I saw a few people fall and break their poles, but the organization had experience of this and provided buckets of extra poles at intervals along the first hill. I escaped unharmed and with equipment intact, although I felt like I was skiing in a daze. I learned later that most people had judged the snow conditions poorly and had the wrong ‘kick wax’ (the one that allows you to push off your skis and stops you falling backwards). I didn’t have this issue given that I had the amateur waxless skiis which use a pattern in the ski base to give a mechanical grip. I wouldn't know what kickwax is unless you used it to remove my chest hair. Going up the hill was sweaty work. 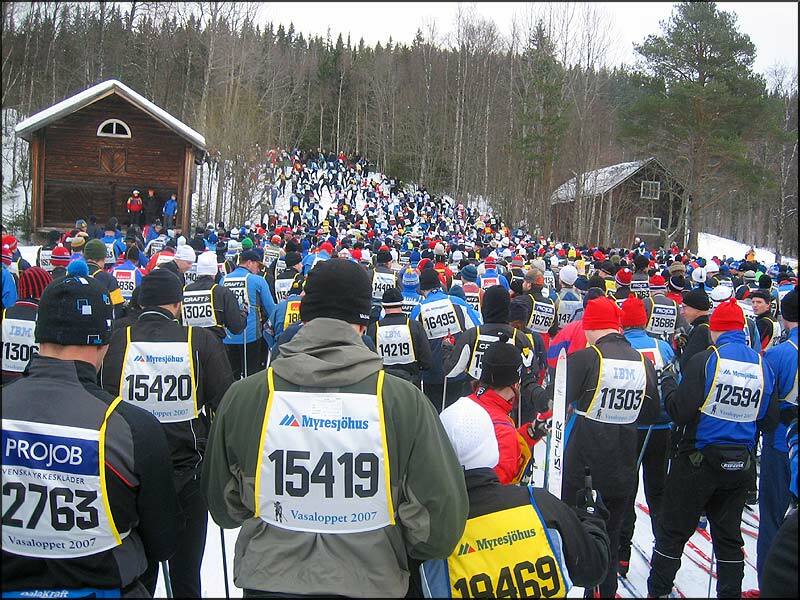 It was much warmer than the -8° Celcius announced for the start, and I was climbing a hill overdressed and surrounded by sweaty Swedes. I drank most of my Camelbak before the first time-check and refueling station at Smagan. Although it was only 10kms into the race, it took me two hours to get there with the endless queue of people. I stopped briefly to fill my Camelbak with water and to undress somewhat. To my disgust, my bag was filled with luke warm water; I guess in a normal year, the water cools quickly outdoors, but this year it remained tepid. The next section towards Risberg was tough. It had snowed overnight and it was warm, which meant that the tracks were quickly ruined. They became a practical demonstration of chaos theory, wiggling in sideways patterns and simultaneous joining or splitting into new tracks. I was spending as much energy stopping my skis from sliding sideways, and keeping my legs roughly together, as I was in projecting them forwards. My usual painfully slow pace was slower still as I skied across endless open fields under a drab grey sky. I remember thinking that 90kms of this was going to take a long time, and it wasn’t going to be much fun. It seemed to take forever to get to Risberg, the 24km mark and other refill. Risberg was an event. I had only taken water to this point and decided to try the sports drink - the local specialty of blueberry soup. The first mouthful was a shock; it tasted like warm, thick Koolaid. The sweetness was startling, almost overpowering. I moved on to the food stand, which Louise had warned me about; the energy food is a kind of soft bun (as much sweet bread as bread). The bun was as dry as fossilized reindeer poo and I could hardly swallow it. The two formed a weird symbiosis, though: Mixing a mouthful of blueberry soup with a bite of the bun made both inedible components palatable. During the whole race I never felt dehydrated or hungry, so there must have been some method to this particular Swedish madness. Setting off from Risberg, I realized that the sound in my iPod wasn’t right. The right earpiece was only vaguely producing sound, but as I had a mild cold, I thought my ears were blocked. This started hours of endlessly adjusting the earpiece and trying to unblock my sinuses without success. Although it sounds trivial, it was really annoying. I couldn’t block out outside sounds and lose myself in my daydreams. To add insult to injury, the sounds around me were all Scandinavian, so I couldn’t even eavesdrop of my fellow competitors. On the plus side, the tracks weren’t as bad as they had been. The route undulated through endless pine forests in an unchanging scenery. I was getting bored. I’d been at this game for 4 hours and knew I had many hours ahead. To pass the time, I started observing the other racers. 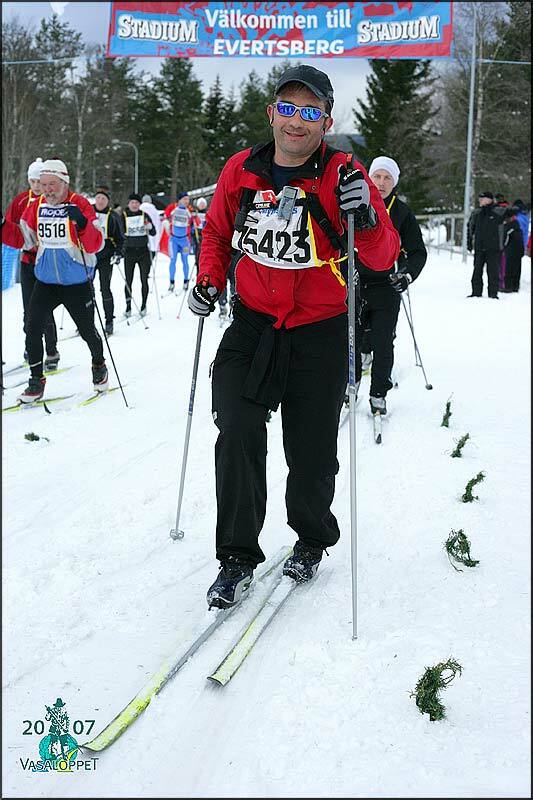 I soon realized that cross-country skiing is the sport that taste forgot, second only to golf for sartorial faux-pas. One older guy that I seemed to be following was wearing an ancient one-piece spandex ski-suit in yellow and bright green, topped off with an orange hat. Other outfits reminded me of my days mountain biking in Germany; swirly patterned pants in rainbow colors. It looked like someone had emptied the bargain bin at the local thrift shop for the blind and handed out the outfits in the dark. To pass the time, I started mentally passing out awards for the most garish and tasteless gear. Buster's still smiling (sort of) coming into Evertsberg. I eventually skied into Evertsberg, the half-way point, for another dose of blueberry-flavored bun. Mentally, it’s all downhill from here. In practice too, there is a 7km downhill stretch straight after the refuel. I was reminded again of the poor standard of skiing. Most people were barely keeping upright, although to be fair, I saw very few falls. Maybe this is my downhill skiing (or snobbery) coming to the fore, or maybe we just have tougher downhill stretches at home to practice on. Either way, I was kept amused, and alert, by wobbling, neon-clad skiers as I overtook them. Sometime after the downhill, gliding through another endless pine forest, there was a sudden exclamation ahead of me above the noise of my iPod. Two girls had met up unexpectedly. At a second look, they turned out to be Louise and Johanna! They were jabbering away excitedly in Swedish as I caught up, asking if I could also join the party. We had a little laugh at the coincidence of all meeting together at the same point, and then skied together until Oxberg. It was a real lift for me at probably the lowest point in the race; mentally, I’d started thinking it was all over as I was past half-way, and then realized I still had 5 hours of skiing left. At Oxberg, Johanna and Louise stopped to get their skis re-waxed, and needing a pee, I skied on to find a suitable pine tree. I didn’t see either again until the finish. After Oxberg, I was starting to see the light at the end of this tunnel. It was another 28km – a long training run - but at this stage it felt like it was nearly over. The kilometer signs which we had been counting down since the start were beginning to be a reason for optimism whereas before they had just been depressing. Along the side of the route, people were handing out sweets, chocolate and oranges which made for a refreshing change from blueberry dough. At Hökberg, I stopped for a couple of cups of broth which I found my body craving – I guess it was the salt. I ate my last energy bar, topped up the Camelbak and set off for the last stop at Eldris. The course was flat, the tracks had improved, and the going was fast. I was double-poling endlessly and it seemed to get easier with every push. 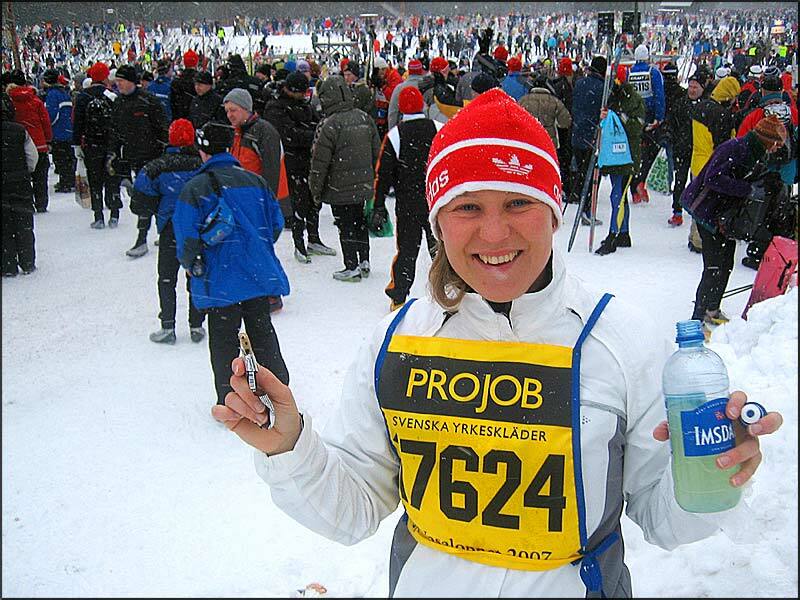 I hardly stopped at Eldris – just a quick drink – and pushed on to the final kilometers. The light was fading, and as the sun set, the air cooled. As a consequence the tracks got faster. The signs were soon in single digits, a source of silent joy, and I finally felt like I was racing. The skiers were well spaced out, and everyone around me seemed to have the same determined optimism. We double-poled towards Mora at an electric, and seemingly effortless, pace. In the final few kilometers, the sun had set, and the track was floodlit, although not especially well. With three kilometers to go, we turned off the fast section and back into some wobbly and undulating tracks. The mix of bad light and poor tracks was a giggle; you couldn’t see the tracks well on the downhill stretch but you knew they would oscillate sideways as you skied downhill. The euphoria of the final few meters was hitting me; I was grinning like an idiot as I whooshed downhill bouncing around like a badly-driven bobsleigh. The last few hundred meters are the home stretch into Mora; I emerged from the calm silence of the pine forest to a busy main street lined with spectators. I pushed with fury to the line, concealing my inner joy along the home stretch in a determined effort to finish stylishly. I crossed the line 10 hours, 28 minutes and 90 kilometers from the start gun. Once I had crossed the line my phone beeped. The race is set up with all kinds of fancy technological gadgets linked to your race chip. I received about ten SMS messages from friends and family congratulating me for finishing, giving me my split times and telling me where Louise was (behind me on the course, as it turned out). All this technology allows you to pull the results apart in any way you can think of. For example, taking out the obviously Swedish names, I figured out later that I was the 6th placed Brit. If that sounds impressive, only 7 finished (20 had signed up). The most incomprehensible fact, though, was that the winners had finished in 4 hours 45 minutes. That is so far away from what I can comprehend that I can only conclude they cannot be human. Equally amazingly, the first woman finished only 3 minutes behind the winner. To add salt to the wound, this year was a slow year for them – the course record is 3 hours 39 minutes! We all met up at the Mora Hotel. The face that peered back at me from the bathroom mirror was caked in dried salt hiding a wind-burn tan. A long shower and quick change of clothing later, and we met for dinner. I felt tired but otherwise OK, although there were signs that things weren’t 100%. It took me about an hour to drink my only beer, but whilst tucking into my meal of reindeer steak (extra potatoes, please! ), I must have downed ten glasses of water. I felt overwhelmed by a need to sleep, and with desert ordered a double espresso to keep me standing. I survived long enough to sit though a couple of songs in the hotel disco – a very quaint small-town-Sweden Sunday night party, populated largely by the middle-aged and not too many skiers. I have no memory of my head hitting the pillow. Louise and I got a lift the next morning back to the start to pick up our car, and then chatted about the race to kill the time for the 6 hour return drive to Stockholm. Oddly, I suffered little over the next few days, although each time I sat down to eat, I felt like I could have eaten my way into the Guinness book of records. I got a lot of mileage with the story back in the office, but I think my colleagues either understand the distance and think I’m nuts, or don’t and struggle put it in context. All my Swedish acquaintances fit into group one, incidentally. Would I do it again? Let’s say, I think it was a once-in-a-lifetime experience. As was, hopefully, my experience of blueberry soup.